LG HVAC is a well-known technology development company, but you may not have realized that the company also offers heating and cooling solutions to customers around the world. LG has heating and cooling products for both residential and commercial customers and the massive tech company brings some modern interface technologies and other cool perks to heating and cooling devices. Unlike other AC and furnace brands, LG HVAC doesn’t offer a wide range of products to the public. It sticks with a couple of the leading technologies and offers top-end products in those areas that people can really make use of. 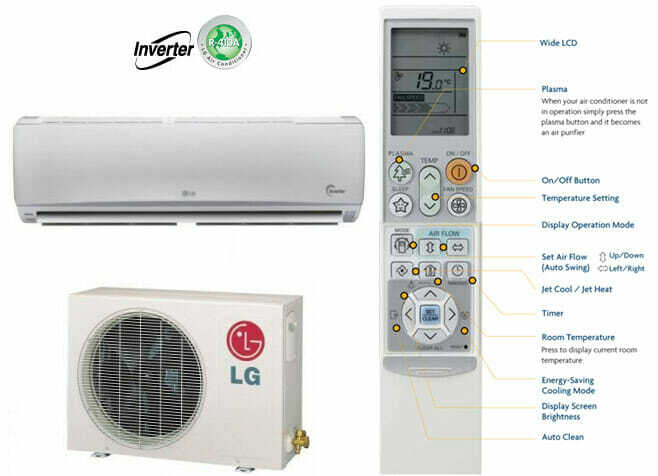 LG offers just two different heating and cooling solutions, one for residential customers and one for commercial, of course there are many variations on the technology and different types of products, but their ductless systems and VRF or variable refrigerant flow technology all builds on the same principles. Businesses are choosing to move away from traditional ducted systems that can be somewhat inefficient for large spaces, toward VRF or variable refrigerant flow technology. This advanced heating and cooling device is more efficient and offers advanced functions that businesses simply cannot get from other products. LG HVAC offers advanced VRF systems that can help improve businesses and how they heat and cool their space. VRF systems have one central hub that helps heat and cool the refrigerant used around the building. This hub is connected to a series of refrigerant lines and terminals that are positioned all over the building. By adjusting the refrigerant flow and heat pump performance the system can provide a variable amount of heat or cooling power to any section of the building at any time. Uniform heat simply doesn’t make any sense. Some areas of a business should be warmer or cooler than others. Warehouse spaces should be cooler than office spaces. Computer rooms should be kept cool even when other sections of the building have to be heated. With an advanced system that uses VRF technology just the right amount of cooling and heating is applied to each space, which lowers the overall energy usage of the system. While a VRF system might cost more initially, the lifetime costs of such a unit are predicted to be lower than most other heating and cooling devices sold today. LG is a big proponent of duct-free cooling and heating. LG supplies both single and multi-zone systems to customers who are looking for a way to enjoy the benefits of duct-free technology. Duct free units use less energy than central ducted systems because no heat energy is lost through ducts. Ducts leak out heat as air moves throughout the home. Even with insulation in place some heat is lost during the trip to the final location. That isn’t an issue with duct-free solutions because the heat is produced right at the location it’s used. It doesn’t make sense to keep every section of a home at the same temperature. Since duct-free systems heat or cool the room they are in, multiple units are needed for a single home. While that makes the equipment a bit more expensive initially, it also means that different rooms can be set to different temperatures so everyone is comfortable. LG has a set of special products and features that really help it stand out from competitors, like advanced controllers, plasma purifiers and computer controlled louvers and fans. LG is known for offering high-tech solutions in terms of electronics and it should come as no surprise that the company offers some advanced control units to pair with their furnaces, air conditioners and ductless units. These controllers come wired or wireless and offer perks like a touchscreen, control over fan speeds of the units and programmable time frames for different feature operations. LG equipment is fitted with plasma air purifying technology. Plasma is created by splitting gas molecules apart with energy. LG furnaces split oxygen molecules apart and the resultant ions collect allergens and other harmful particles in the air more effectively than a filter can. This enables LG heating and cooling devices to improve air quality effectively over time and leave a home with cleaner air than ever before. LG equipment comes with adjustable louvers and fans that send air to different locations and different rates. Each of these technologies are connected to computers built into the units to help them make smart decisions for efficiency purposes. LG is a leading tech company in the world and it’s bringing some of that technology over the to HVAC industry, when you want a reliable heating and cooling device for your home, especially if it’s VRF or ductless technology, LG is a good brand to go with.